Hotel Okura Tokyo Bay is an urban resort filled with a classic and sophisticated atmosphere. It has an exterior look that is reminiscent of a palace, an elegant lobby decorated with seasonal flowers, and an open-air courtyard in the middle of the building that brings plenty of natural light into the corridors, as if staying at a resort in Southern Europe. 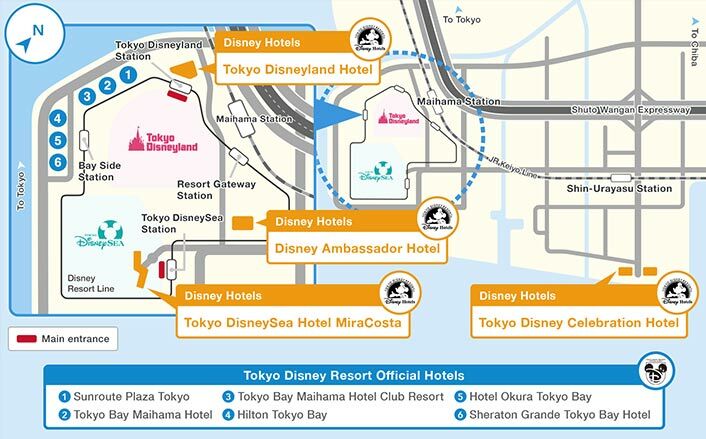 Tokyo Disney Resort Vacation Packages are official accommodation plans that include hotel stays, special Park tickets, and Disney FASTPASS tickets which allow access at any time to select attractions with a minimal wait. Get off at Maihama Station (South Exit) on JR (Japan Railway) Keiyo Line / Musashino Line. Take the Disney Resort Line monorail from the Resort Gateway Station adjacent to JR Maihama Station and get off at Bayside Station. Complimentary shuttle bus service aboard the Disney Resort Cruiser is provided between Bayside Station and the hotel. Complimentary shuttle bus service aboard the Disney Resort Cruiser is provided between the hotel and Bayside Station on the Disney Resort Line. You can then take the Disney Resort Line monorail to Tokyo DisneySea Station and Tokyo Disneyland Station.